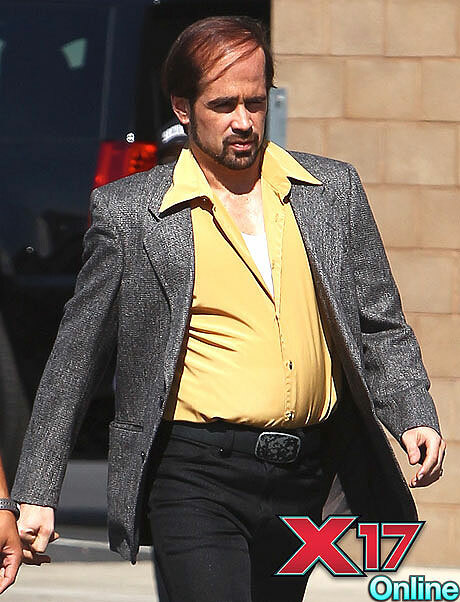 Relax, ladies – Colin Farrell is only wearing a fat suit, and he’s not going prematurely bald! The always lean actor wore the extra padding last week on the Californian set of his upcoming film Horrible Bosses. He’s obviously down to play a rather unsavory character, judging by the look of his appearance. The film also stars Jennifer Aniston, Jamie Foxx, Kevin Spacey and Jason Sudeikis from Saturday Night Live. Colin’s actually in the best shape of his life these days. He’ll soon start filming the remake of the Arnold Schwarzenegger classic Total Recall, and if there’s one thing that Arnie doesn’t have, it’s a large gut! Colin so far is the only cast member announced for the film, but he won’t be short of top-flight female company on set. Among those mentioned as possible co-stars are Eva Mendes, Jessica Biel, Kate Bosworth and Paula Patton.